Looking for styles to change your old glossy buttons with modern day flat designs and 3d buttons ? You have come to the right place as i am currently compiling a list of css buttons for every day website use. The list is still ongoing with regular updates so you might want to bookmark this page(Ctrl+D) for future reference. Starting from great toggle buttons to morphing buttons, here you will find everything from minimal designs to fully animated flyover hover style buttons. Let me know how your website looks after adding these cool css3 buttons. The social media buttons with css code can be found in our last topic in css category, make sure to check it as well. A smooth animation of removing a selected content from the web. This is worth a look. A css3 button with a popup window made with jquery and css. On click this button will flip the delete button to show confirmation box. The flip has multiple angles when clicked from any four sides. A set of call to action buttons with animation to grab user attention. A toggle buttons in pure css from codepen user. A code free to download with css button, html and jquery programming. This one is amazing to look at when user clicks it also displays number of downloads. Choice of radio css3 buttons with yes or no action. Amazing css transitions in play in this set of over 50 buttons. A total cool concept and development of css buttons for the modern day website without adding too much code. A must have template for developers who are looking for new code to learn. Click the button to get a popup of flat design widget either its login, signup or terms and conditions. A button with a flyaway animation of mail will be much interesting to see in your website. A simple and minimal design of 3d button with a nice push hover effect. A minimal invert hover effect will interest some who are looking for a simple design for their css buttons. This button concept for downloading files with the file transfer status and completion along with a reset button. 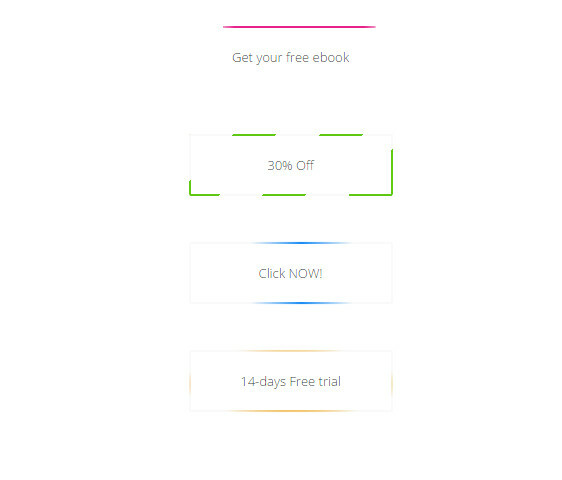 A flat color with a little 3d shadow effect makes this simple css3 button visually appealing. Another simple display of minimal css button for free download. Get your website visitors to click this pulsing button which is very cool and the best option to grab user attention and make users click it. A set of round buttons for a website. The simplest set of css buttons with light hover effect and this suits great for long term usage. How to add this buttons on blogger? Great list of buttons. How can I use these buttons on wordpress? I am using iconic one theme, please guide me.